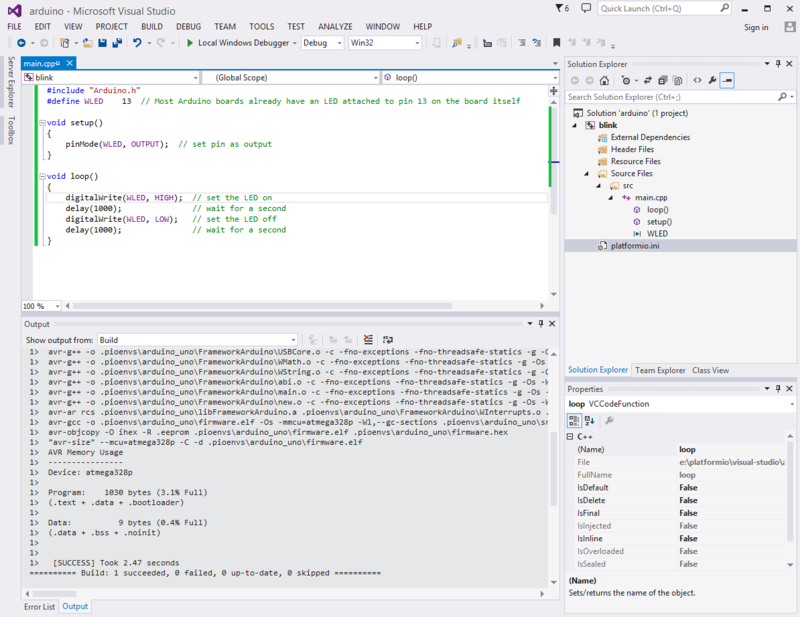 The Microsoft Visual Studio (Free) is an integrated development environment (IDE) from Microsoft. 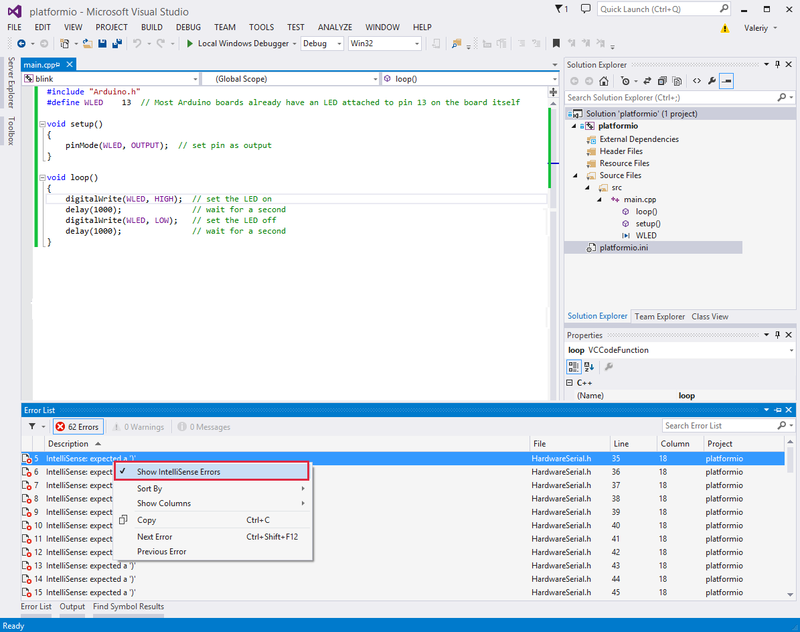 Visual Studio includes a code editor supporting IntelliSense (the code completion component) as well as code refactoring. 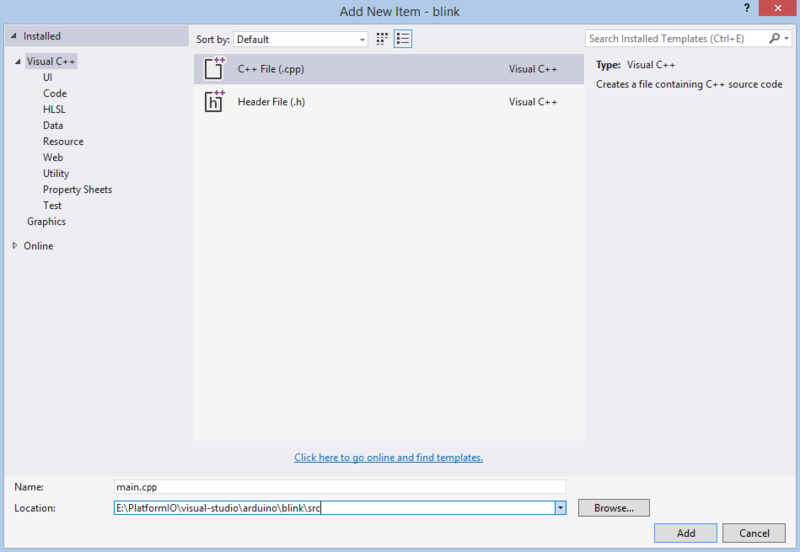 Refer to the Visual Studio Documentation page for more detailed information. Build project: Menu: Build > Build Solution. 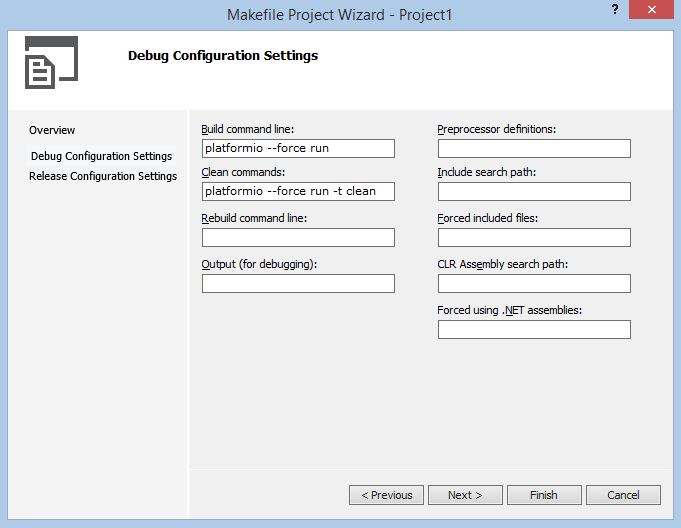 First of all, let’s create new project from Visual Studio Start Page: Start > New Project or using Menu: File > New > Project, then select project with Makefile type (Visual C++ > General > Makefile Project), fill Project name, Solution name, Location fields and press OK button. If we want to use native AVR programming, we have to specify additional preprocessor symbol (“Preprocessor definitions” field) about your MCU. For example, an Arduino Uno is based on the ATmega328 MCU. In this case We will add new definition __AVR_ATmega328__. 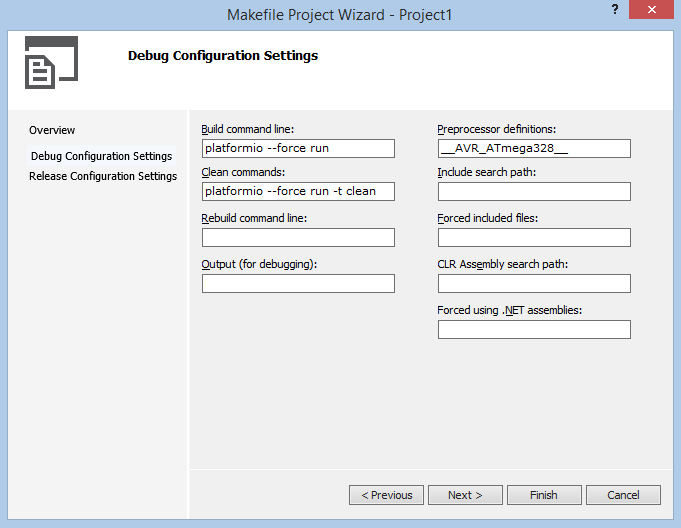 Release Configuration is the same as Debug, so on the next step we check “Same as Debug Configuration” and click “Finish” button. Copy the source code which is described below to file main.cpp. 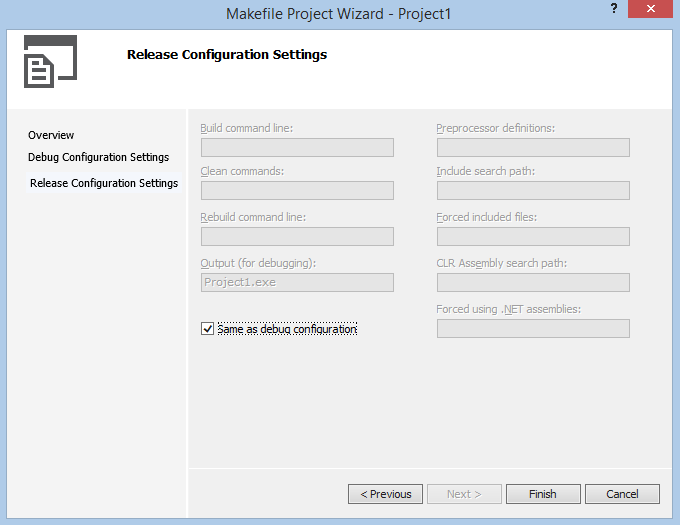 Project Configuration File named platformio.ini must be located in the project root directory. Copy the source code which is described below to it. 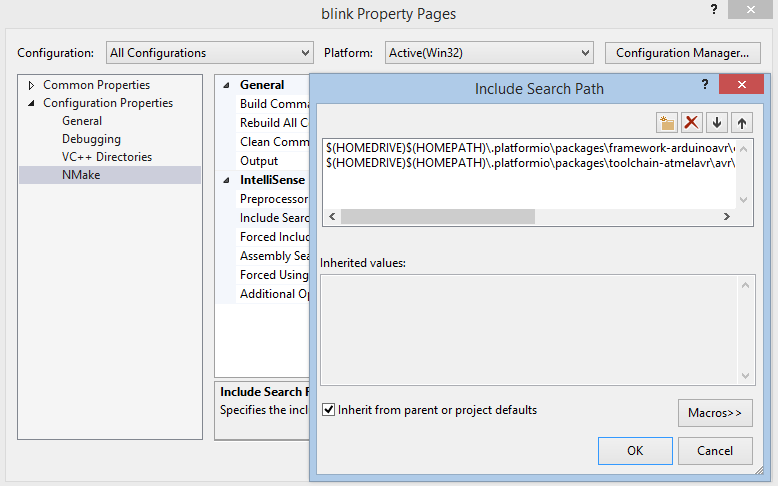 Taking everything into account, we can build project with shortcut Ctrl+Shift+B or using Menu: Build > Build Solution. 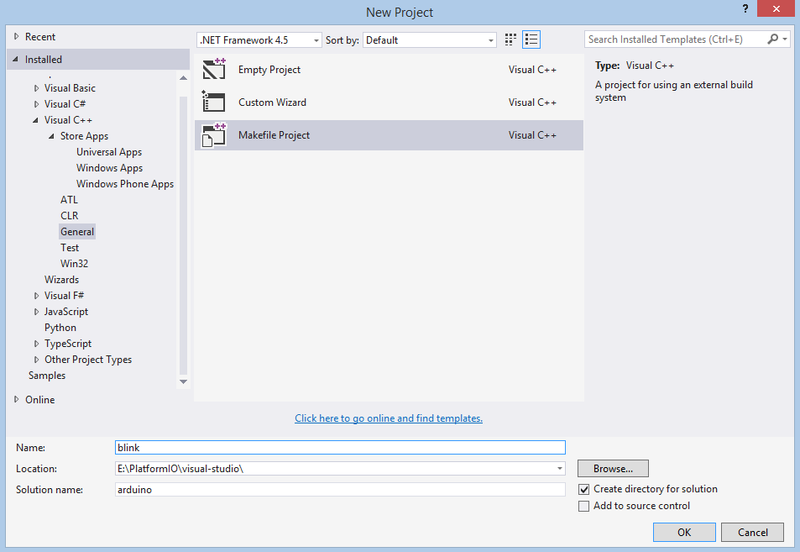 VS Studio does not allow one to specify for project other toolchain which will be used by IntelliSense. In this case, IntelliSense does not understand GCC-specific definitions. However, these errors does not have any influence on PlatformIO Build System. It means that you can ignore them and rely on PlatformIO Build System messages which will be shown in output console after build.